It’s no secret that all sorts of nasty storms can roll through South Carolina, particularly during the summer. Unfortunately, as a homeowner, there isn’t a whole lot you can do to prevent hail damage to your roof. In this blog post, we will provide you with some expert tips on not only how to identify a hail damaged roof, but the steps you should take following a major storm. Before we get into identifying hail damage, let’s first discuss some factors that have an impact on the degree of damage. Wind – As mentioned in this resource from Travelers, wind direction and speed can vary during a hailstorm. Keep in mind that these changes can affect the location and severity of hail impact. Size and density – Wouldn’t it be nice if all hailstones were the same size? Unfortunately, that isn’t the case. From pea size to as large as a softball, you really never know what to expect. Plus, rarely do hailstones have smooth edges, which also plays a part in the damage they can cause. Building materials – The hail damage to your roof could be much different to that of your neighbor, depending on the type of building material. It’s also important to consider that the age and condition of your roof could affect the degree of damage as well. Barriers – Do you have any tree branches, landscaping, fences, or nearby homes that would reduce the chance of hail damage to your roof? Natural barriers and neighboring structures can definitely play a role here. 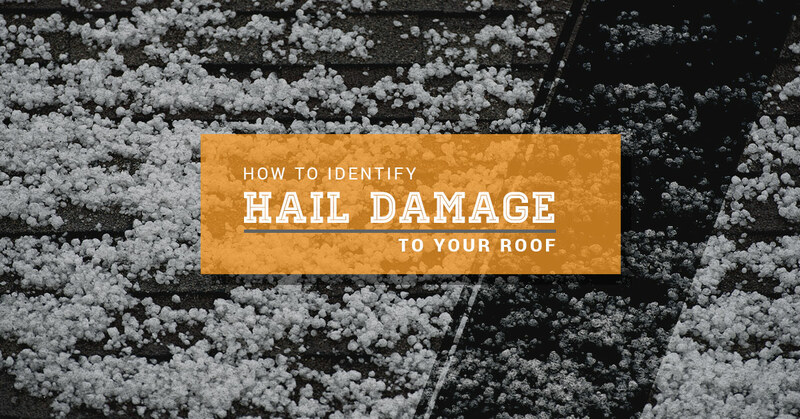 Now it’s time to determine if you have roof has hail damage. Remember that asphalt/composition shingles can look much different than wood shingles in this regard. Let’s start with looking at composition and asphalt shingles. If you believe that you have a storm damaged roof on your hands, it’s time to get in touch with the professionals at Sands Roofing and Construction in Lexington. We can take the hassle out of the process by walking you through the necessary steps with your insurance company. Not only will we team you with a seasoned roofer, but also a licensed insurance property adjuster. This ensures that you will receive a fair settlement for your insurance carrier. No other roof replacement service in town can handle your claim filing to closing like we can. With decades of experience, our team thrives in residential roofing. Rest assured as a local company, we’ve established a solid reputation among Lexington homeowners. Customers appreciate that there aren’t any gimmicks with our service. We will always provide the highest quality of work while also communicating with you every step of the way. Because we value our customers, we are proud to say that all of our roofs come with a full warranty. Don’t fall for those shady storm chasers that go door to door trying to drum up business. Instead, put your trust in a roofing company that treats people the way they want to be treated. We can even go the extra mile and handle water damage cleanup or emergency water cleanup if you don’t have much time. Call Sands Roofing and Construction for a free assessment.